My latest project comes with a story. There once was an Oddish who was walking through the Ilex Forest. During her walk she came across a new object. The object was round and spikey, something that the Oddish had never seen before. Curious, the Oddish got closer to the object. It started glowing, and the Oddish felt a strange feeling come over her. Within moments, the feeling was gone. 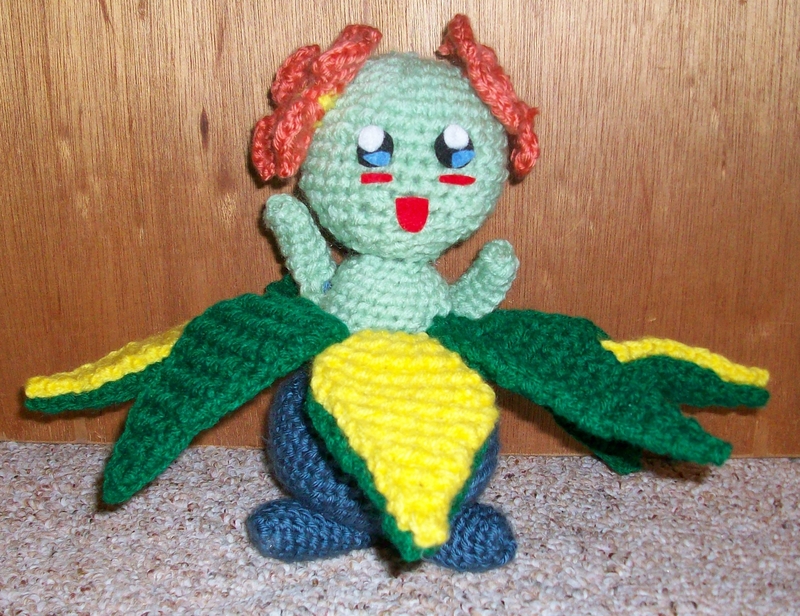 However, the Oddish was no longer an Oddish, but was now a beautiful Bellossom (skipping over evolving into Gloom). Okay, story time is over. 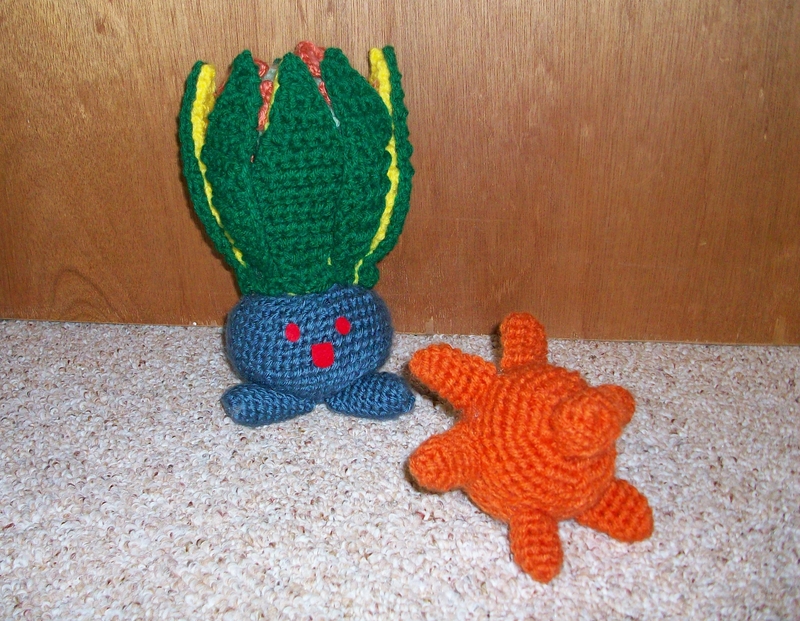 If somebody would have told me a couple months ago that my first project after the eevees was going to be an Oddish, I would have laughed in their face. To me, Oddishs are the annoying little weeds that always get in my way when I’m on a mission in a Pokemon game. The only reason why I would ever capture one was to evolve it into a cute Bellossom and name it Hula. Also, it wasn’t until I was done, did I remember that you have to first evolve Oddish into a Gloom at Level 21, BEFORE you can evolve it into a Bellossom. I forgot that little detail, because I hardly ever use Gloom in my games. Instead I capture a level 20+ Oddish, level it up and evolve it into Gloom, and then evolve it into Bellossom. The amount of time it spends as Gloom is the amount of time it takes me to go into my bag and give it a Sun Stone. So please look over that technical aspect of the design. The good news is that there already are patterns available for Bellossom and Oddish. I only had to come up with a way to merge them and create leaves that would work for both. The sun stone was just extra; you don’t have to make it if you don’t want to. I just thought it would be a fun addition to complete the evolution process. Caron Simply Soft ‘Country Blue’ for Oddish’s body, Caron Simply Soft ‘Persimmon’ for the flowers, Red Heart Super Saver’s ‘Bright Yellow’ for the leaves, Red Heart Super Saver’s ‘Honeydew’ for the light green of Bellossom’s body, and Red Heart Super Saver’s ‘Paddy Green’ for the darker green of the leaves. I have no issues with people using my pattern, as long as they don’t make a profit off the pattern, or leafeon. Also, please don’t copy the pattern when putting it on other websites, just paste the link to the original pattern. The pattern for the Sun Stone can be found here. 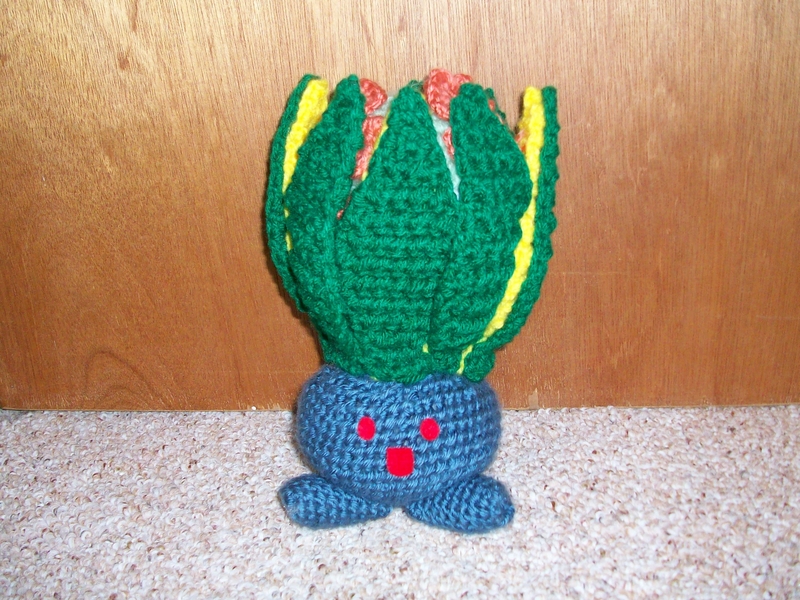 Oddish (grey blue): Use Wolfdreamer’s pattern available here. Follow the instructions for the legs and body. 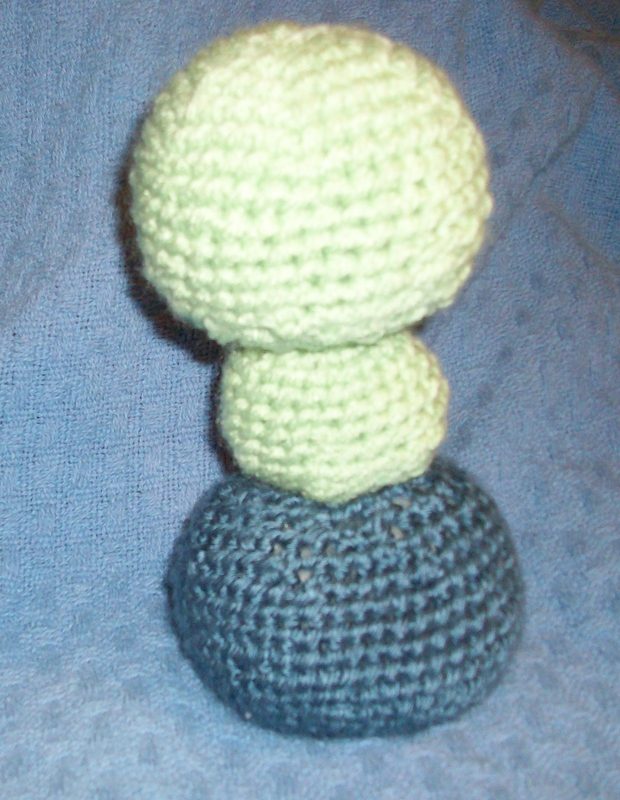 Bellossom: Use the pattern available here. Follow the instructions for the head, arms, and the flowers on top of the head. Then attach Bellossom arms to the Bellossom body, and Oddish’s feet to the Oddish body. 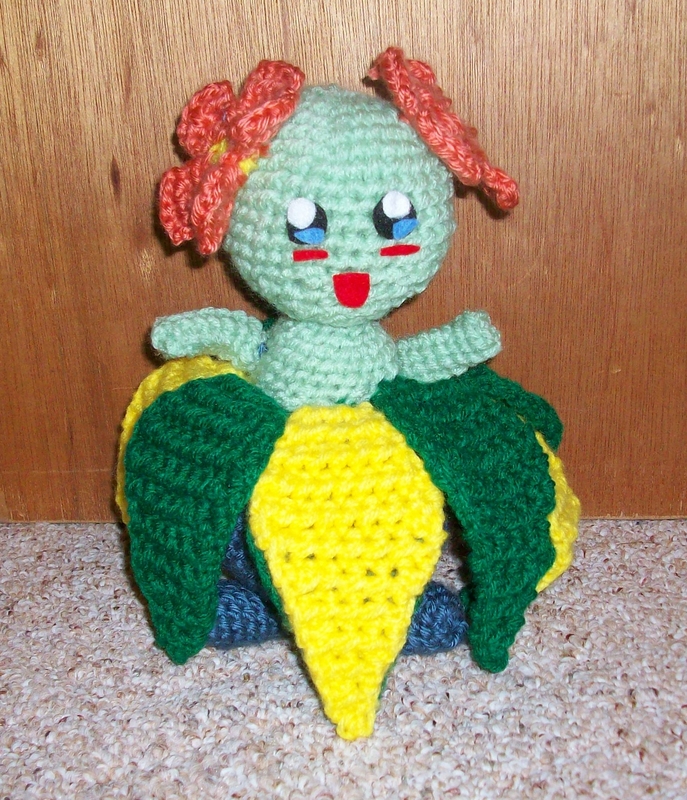 Assemble the petals of the flowers as instructed, and attach to Bellossom’s head. Take the yellow leaves, and try to find the green leaf that most closely resemble it in size. I hot glued my leaves together, gluing everything but the small little square at the bottom. This was so I wouldn’t have to force my way through hot glue when attaching the leaves to the body. Below shows the two leaves glued together, leaving the small square bits unattached. Or you can sew them together. 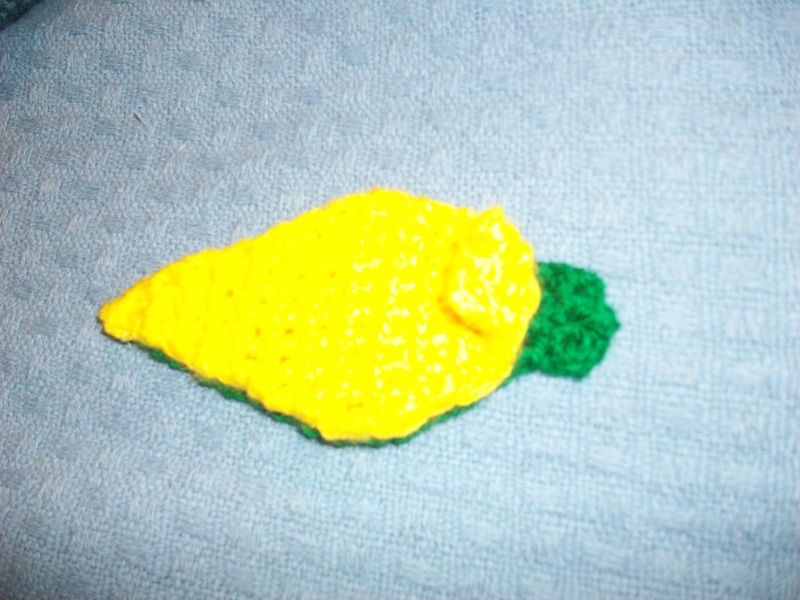 I didn’t because I was too afraid of having one color to match on one side of the leaf, but to stand out on the other. You know should have four regular green leaves, and four leaves with yellow on one side and green on the other.Attach the leaves to the body by the square little ends. These parts should remain hidden when you have Bellossom, but seen when you have Oddish. Optional is rubber-banding the leaves curled up for a couple days to get them used to the shape. Use felt to make the faces for Oddish and Bellossom as shown. Overall, I like being able to go from Oddish to Bellossom. Yes, you can see bits of Bellossom while it’s Oddish, the leaves might not stand up quite all the way on their own, but it’s fun going from one form to another. I haven’t seen any other design capable of evolving from one pokemon form into another. 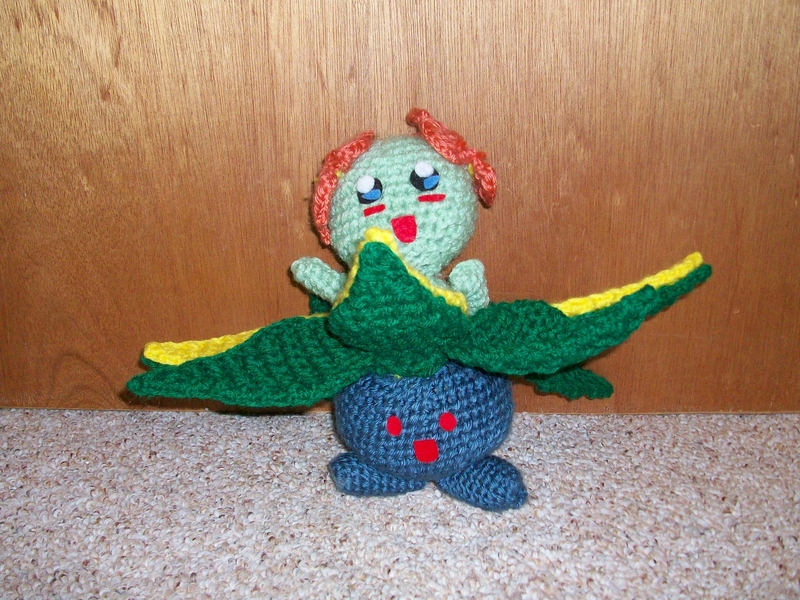 This entry was posted in Completed Pokemon, Modified Patterns and tagged amigurumi, bellossom, oddish, pokemon by chainoneandturn. Bookmark the permalink.